SFH for all things Science fiction, Fantasy and Horror. Supportive, fun, and welcoming group to everyone. At SFH, no one gets left behind! “Is that your trike?” Uscanth asked Barbara as the two of them approached the parking lot. “Hell no,” Barbara replied as she pulled out her keys. Just ahead of them stood three parked vehicles: a trike, a hybrigyro and a hybribike. When Uscanth heard the click of the hybigyro’s doors unlock the male Drall was quite relieved. “So how is the campaign going?” Uscanth asked as the two of them got into the hybrigyro and buckled their seat belts. Mass Foundations? - 3Title: Mass Foundations? The console in Shepard’s cabin beeped. It was Eric’s voice. “Go ahead,” Shepard replied and waited. Less than a minute later, Eric stepped inside from the elevator. For a moment, he found himself distracted by the aquarium, filled with exotic fish, and the miniature ships mounted on the glass display. “You said you wanted to talk?” Shepard asked, snapping Eric out of his thoughts. Possessed. Chapter 12The feeling of anxiety filled Sandra’s mind all the next day. Today was Monday and she had to pay a visit to the psychic. She truly hoped that she could help, but if not, then at least she would provide some information about the entity that haunts her and how to get rid of it. She was so nervous that it was impossible to concentrate on anything else but the impending meeting with the woman named Joan Henderson. All Sandra could do now was waiting until her mother returns home and then drives her to the psychic. She was now too scared to move around on her own as Jason Voorhees might attack her again, or worse, to use her to commit another murder. Disclaimer: Mass Effect belongs to BioWare and EA. The Fifth Fleet used to be at Arcturus Station, that much was certain. Many of its starships went to the Citadel to aid the other species in fighting the geth. They remained in the Widow system for the time being until the situation at the station had subsided. Among the fleet was the SSV Perugia, commanded by Rear Admiral Mikhailovich. It was one of the remaining cruisers left standing after Shepard ordered the fleet to save the Destiny Ascension at any cost. News and Journals from around DA. October Dragon Effect OC competition REMINDERREMINDER - TWO DAYS TO GO!!!!! Due to the polls being too close to call, your theme for the month will be both..... DRAGON AGE AND / OR MASS EFFECT!!!! You'll have from now until the end of October to give everyone enough time to get an entry in. The prize for the winner will be three months premium DA membership or the equivalent in DA points. The winner will be voted on by myself and the entrants. The catch is that you can't vote for your own entry. Our mission, should you choose to accept, is to seek out new art, new literature, and new artistic civilisations. To boldly go, where no group has gone before. With your help, we will make it so. And there is coffee in this nebula. We are for all things Science Fiction, Fantasy, and Horror. We're here primarily to encourage artists to help each other out, and be supportive, while having lots of fun along the way. Everyone is welcome. Please be polite and use common sense. Anything submitted with a mature content must be marked appropriately. Any questions, just contact one of the team. Cheers guys. (Abuse will not be tolerated, unless you ask politely, then we'll see what we can do). 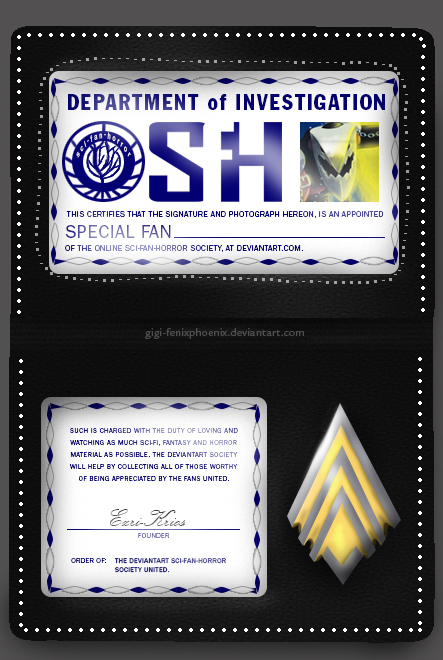 Huge thanks to Gigi-FenixPhoenix for creating our amazing ID badge. To Advertise your contests, commissions, or other news, just send us a note. KKylimos - Illustration/comics/creature design/album covers... - Cash only. MEWOAH fav.me/d6kvdg3 - Art trades. AuthorOfSins Send her a note - Art trades. Further to our last journal - sci-fan-horror.deviantart.com/… - I'm happy to report that I found some of our admin and, like a well train sheep dog, have managed to herd a couple back from the wilderness. Has been approving your art as and when she can, pretty much on her own, while I was away and oblivious to the issues, and will be continuing to do so. Has kindly offered to share his blogs with us, and I'll have to tap him up for a chat soon about his new book. - People to run the gallery. If you like organising and have a spare half hour a week, this ones for you. - Interviewers. If you enjoy talking to fellow artists and would like to do a monthly, or two monthly feature, contact me. It doesn't matter if you have no experience, you'll be fully supported if you want it. Please come have a chat with me if you would like to help out. We need you! Even if you don't have the time to be admin, I would be very grateful if you could add a note in your journals to let people know we need admin. Thank you very much to for using your journal to give us a shout out. It's really appreciated. Finally, it would be great to hear what you would like to see from SFH. We want to support you and your art, whatever kind of SFH'er you are. Please give us your wish lists and ideas, so we can build this group in the direction you want it to go. What features would you like to see? Do you know any artists that you would like to see us interview? What kind of things would you like to see discussed and debated? The more feedback we get, the better we can do. 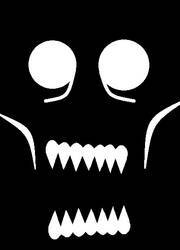 As always, your thoughts and ideas are very welcome, hell, they're imperative! PS. Note to admin. Alas, I don't have time to contact everyone individually, but I'd like to have a small team in place before I go into hospital in the next few weeks. As such, if you're tagged below, can you please drop me a note to let me know if you can still admin the group. Anyone who can't, or who isn't around anymore to see this, will be moved to members, with huge thanks and gratitude for all the time and hard work you put into the group. If you see this after you have been moved to members, but still want to admin, just send me a note and I'll move you back. Thanks guys. Remember: It costs nothing to encourage an artist, and the potential benefits are staggering. A pat on the back to an artist now could one day result in your favourite film, or the cartoon you love to get stoned watching, or the song that saves your life. Discourage an artists, you get absolutely nothing in return, ever. Check out these great entries from 's Halloween Contest. In the Kitty - 2,248. Please donate here. ezri-krios.deviantart.com/ Thanks. We're accepting deviations still. As for any other activity, I couldn't say. I just accept deviations. That would've been my fault, most likely. I don't always get to submissions before they expire and as I'm the only person accepting them—so far as I'm aware, at least—sometimes a few things slip through the cracks. Thank you very much for accepting my work 'The Balrog - Study #1'! Thank you very much for accepting my work 'Scavenger #6'! Thank you very much for accepting my submission 'Scavenger #4'! Thank you very much for accepting my work 'Dreaming of the Future'! Thank you very much for accepting my work 'Scavenger #3'!